Comic-Con International has released the full Sunday schedule for Comic-Con 2018, which runs from Wednesday, July 18 through Sunday, July 22. As usual, Sunday is ruled by TV. The biggest event of the day is a special Supernatural video presentation. We'll also get panels for Riverdale, Legion, and a first look at Mayans MC. 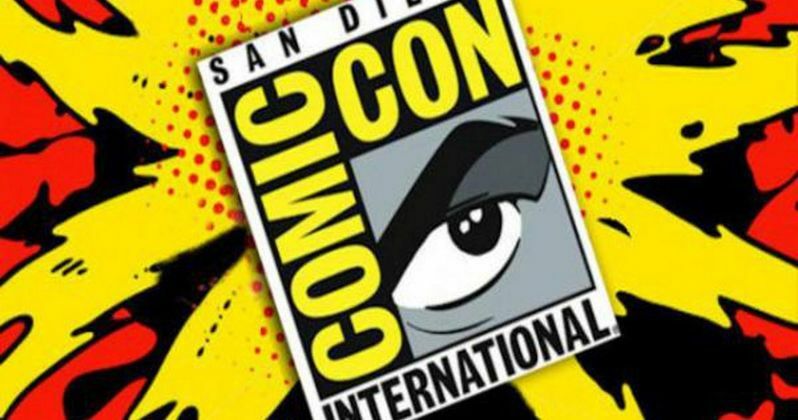 As always, we have pulled out the movie, TV and home video-related panels and events for San Diego Comic-Con 2018, Sunday, July 22, which you can check out below. LEGO Ninjago: If you think ninja and LEGO are cool, then this is the panel for you! Ninjago veterans Tommy Andreasen (co-creator/producer) and Michael Svane Knap (LEGO senior design manager) are joined by lead writer Bragi Schut, voice talents Brent Miller (voice of Zane), Kelly Metzger (voice of Nya), and Vincent Tong (voice of Kai) to talk about their favorite memories and other reflections on creating LEGO's longest running and most successful show. Bring the kids! Ninjaaaaa-GO! Moderated by the LEGO Group's Brian Bowler. Sunday July 22, 2018. 10:30am - 11:30am. Room 6A. Supernatural Special Video Presentation and Q&A: The series' stars and executive producers answer questions about the shocking events in last season's intense finale and reveal what's in store for the 14th season, when the show will reach the rare milestone of 300 episodes! Fans will also be treated to an exclusive video presentation featuring series highlights. Supernatural will return to The CW on Thursdays this fall in its 8/7c time period. The series is produced by Kripke Enterprises Inc. in association with Warner Bros. Television. Sunday July 22, 2018. 10:30am - 11:30am. Hall H.
Riverdale Special Video Presentation and Q&A: Following yet another drama-filled season and shocking season 2 finale, don't miss Riverdale when it returns to San Diego for its third appearance at Comic-Con-this time in Hall H! Catch up with Archie and the gang as they continue to dive into the secrets that loom and keep emerging from the shadows in a town that once seemed like a quiet, ordinary place. The circumstances surrounding Archie's arrest kick off the drama of season 3 as the gang tries to #FreeArchie and Hiram Lodge continues to flesh out his plans to control not only Riverdale but the ever growing SoDale. Based on the characters from Archie Comics and produced by Berlanti Productions (The Flash, Supergirl, Blindspot, Arrow, DC's Legends of Tomorrow) in association with Warner Bros. Television, this one-hour drama is a bold, subversive take on the surreality of small-town life. See a special video presentation followed by a Q&A with series starsand producers. Riverdale's season 3 returns Wednesdays at 8/7c on The CW. Sunday July 22, 2018. 11:45am - 12:45pm. San Diego Comic-Con 2018 World Premiere of DC Super Hero Girls: Legends of Atlantis: The girls of Super Hero High take a deep dive in their latest adventure as Warner Bros. Home Entertainment brings the World Premiere of DC Super Hero Girls: Legends of Atlantis to Comic-Con International. In this all-new entry to the worldwide DC Super Hero Girls franchise phenomenon, the young super heroes must venture to Atlantis when the powerful Book of Legends is suddenly stolen from Super Hero High. Once there, Wonder Woman, Batgirl, Supergirl, Bumblebee, and the rest of the Super Crew must contend with the formidable Mera and Siren, the ocean-dwelling thieves. In order to recover the stolen tome and return it to its rightful place, the Super Hero Girls must band together and use their collective powers to successfully get back to land . . . and back to class! Grey Griffin (Velma in the Scooby-Doo franchise), voice of Wonder Woman, will give a special introduction to the film. Produced by Warner Bros. Animation, DC Entertainment, and the LEGO Group, DC Super Hero Girls: Legends of Atlantis will be distributed by Warner Bros. Home Entertainment August 21 on digital, and September 18 on DVD. Sunday July 22, 2018. 12:15pm - 1:30pm. Room 6BCF. Women of Marvel: Across comic books, television, new media, and more, the women of Marvel are here and here to stay! Attend this conversation with behind-the-scenes talent from Marvel Rising and creatives in the field, and hear firsthand what it's like working as a woman in comics and what it means for the future of the industry. Hosted by Marvel's Sana Amanat (VP of content and character development) and Judy Stephens (producer at Marvel), with additional panelists to be announced. Sunday July 22, 2018. 12:30pm - 1:30pm. Room 6DE. Mayans M.C. Discussion and Q&A: Mayans M. C. is the next chapter in Kurt Sutter's award-winning Sons of Anarchy saga. Set in a post-Jax Teller world, Ezekiel "EZ" Reyes is fresh out of prison and a prospect in the Mayans M.C. charter on the Cali/Mexi border. Now, EZ must carve out his new identity in a town where he was once the golden boy with the American dream in his grasp. Featuring co-creator/executive producer/writer/director Kurt Sutter,co-creator/co-executive producer/writer Elgin James, and executive producer/director Norberto Barba, and stars J. D. Pardo, Clayton Cardenas, Edward James Olmos, Sarah Bolger, Michael Irby, Carla Baratta, Antonio Jaramillo, Raoul Max Trujillo, Richard Cabral, Danny Pino, Emilio Rivera, Frankie Loyal, Joseph Lucero, and Vincent "Rocco" Vargas. Sunday July 22, 2018. 1:00pm - 2:00pm. Hall H.
Marvel Animation Presents: Marvel Animation presents an action-packed, news-breaking panel that'll leave you begging for more! This year they are going royal with the Wakandan king himself, T'Challa, as they preview the new season of Marvel's Avengers: Black Panther's Quest. Plus, tons of exclusive info on fan-favorite series Marvel's Spider-Man, as well as other exciting projects. Hosted by the calamitous Cort Lane (SVP, Animation and Family Entertainment), the effervescent Eric Radomski (SVP, production and creative director, Marvel Animation), andthe horrendous Harrison Wilcox (senior director, development and production), you'll get eyefuls of never-before-seen information and sneak peeks . . . plus surprise panelists and a can't-miss Marvel Team-Up live! Get there! Sunday July 22, 2018. 1:30pm - 2:30pm. Room 6A. World Premiere of LEGO DC Comics Super Heroes: Aquaman: Rage of Atlantis: Aquaman must battle foes in the air, on land, and in the depths of the Seven Seas, along with some help from The Justice League, to save the day in his latest animated adventure, LEGO DC Comics Super Heroes: Aquaman: Rage of Atlantis. Enjoy the first-ever live showing of the film, then prepare for laughs when the postscreening panel takes the stage. Discussing the fun of making a LEGO movie will be actors Dee Bradley Baker (American Dad!) as Aquaman, Troy Baker (The Last of Us, Batman: Arkham Knight) as Batman, Grey Griffin (DC Super Hero Girls) as Wonder Woman and Lois Lane, Cristina Milizia (Bunsen Is a Beast) as Green Lantern/Jessica Cruz, Susan Eisenberg (Justice League / Justice League Unlimited) as Mera, Eric Bauza (The Adventures of Puss in Boots) as Jimmy Olsen, and Fred Tatasciore (Batman Ninja) as the villainous Lobo. Filmmakers on the panel include Matt Peters (LEGO DC Comics Super Heroes: Gotham City Breakout), screenwriters Jim Krieg (Batman: Gotham By Gaslight), and Jeremy Adams (LEGO DC Comics Super Heroes: The Flash), and executive producer Brandon Vietti (Young Justice). As usual, expect some additional surprise panelists, plus everyone in the audience will receive an exclusive LEGO mini-figurine of Jessica Cruz/Green Lantern! Produced by Warner Bros. Animation, DC Entertainment, and the LEGO Group, the film will be distributed by Warner Bros. Home Entertainment on July 31 on Blu-rayT Combo Pack, DVD, and digital. Sunday July 22, 2018. 1:45pm - 3:30pm. Room 6BCF. X-Men: The Animated Series Celebrates 25 Years: Series showrunner Eric Lewald (author of Previously on X-Men: The Making of an Animated Series), series producer/director Larry Houston (SDCC special guest), and series writers Julia Lewald and Len Uhley participate in a spirited discussion with behind-the-scenes stories about the making of the #1 hit. Sunday July 22, 2018. 3:00pm - 4:00pm. Room 7AB.